The Secretary of State for Social Communication (SECOMS), Merício dos Reis 'Akara' and the Secretary of State for Equality and Inclusion, Maria José de Jesus, launched on Thursday, December 6, at the premises of The Asia Foundation in Luro Mata in Dili, the mobile application Hamahon (shelter), a website and a media resource pack on the prevention of violence against women. The "Hamahon" application helps police, service providers and women find contact information for support services. The platform also allows service providers to easily update their contact information and flag inactive phone numbers. The media resource pack contains resources to help journalists write information about violence against women and children in a respectful and dignified way. This toolkit seeks to help journalists understand deeper violence against women and to develop evidence-based news stories that are presented in a sensitive way. In his speech, Merício dos Reis 'Akara' stated that this toolkit aims to 'promote participatory communication'. Akara also noted that "journalists need to learn more about gender issues and domestic violence. It is necessary to give journalists a good knowledge on this issue so that they write responsible news, using specific terms". The Secretary of State for Equality and Inclusion said that the launch of this mobile application could encourage victims to file a complaint through this application, with which they could have access to all the necessary information. In addition, it promotes a fair investigation process for the victims". Maria José de Jesus said that she believes that the "innovative use of information technology will further enhance the quality of services provided to victims" and that "this application contributes to the change of mentality and attitude of the people to combat violence against women and children". She added that "journalists can, with the support and knowledge offered by this application, improve their news on gender issues and present them on the basis of evidence". The charge d’affairs of the Australian Government, Philipa Venning said: "The new application could save victims of domestic violence by providing the means to quickly access care and support. 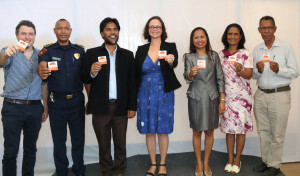 "Working to eliminate violence against women continues to be a high priority of the Australian cooperation program, and we are proud to support the strong leadership role of the Timorese Government in this matter," added Philipa Venning. These resources were developed in partnership with the Nabilan Program, an initiative of Australian cooperation implemented by The Asia Foundation and Catalpa International.